It was amazing to join so many passionate and dedicated young people from the Cancer Action Network at the "Tobacco 21" press conference today. Tobacco 21 is a national campaign aimed at raising the minimum legal age for tobacco and nicotine sales in the United States to 21. (From CT Tobacco 21.org) Currently, 1,500 children become daily smokers each year, and an estimated 56,000 children now under the age of 18 will eventually die due to smoking. The result is an annual health care cost of $2.03 billion that is caused by smoking, with an additional $1.25 billion in lost productivity. I'm proud that the Public Health Committee passed Senate Bill 164 out of committee this week, which will raise the age to 21. 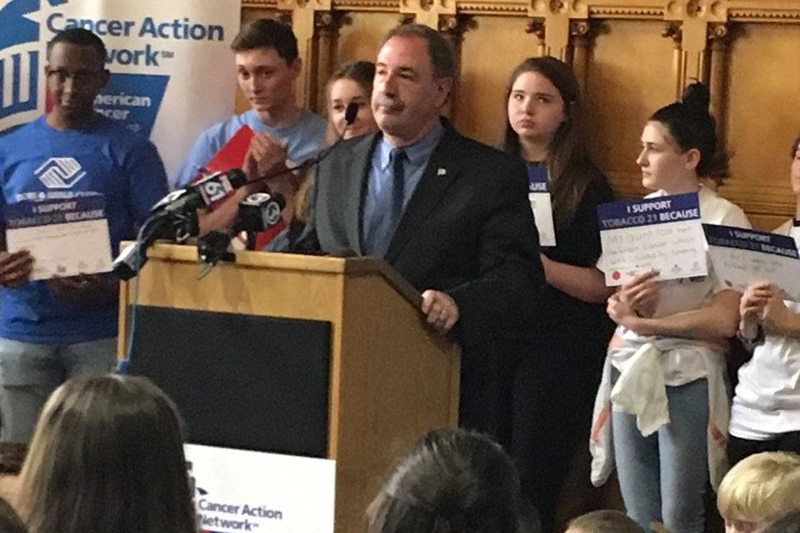 I call on all my colleagues in the Legislature to follow the lead of our courageous teenagers and make Connecticut a Tobacco 21 state.